While some of our projects are already staffed or completed, we invite you to join the database of volunteers for projects farther out on the horizon. Some are listed below. Headquarters of Kòdinasyon Peyizan Nan Ma. We seek grants and donations for a solar-powered center for Internet access and computer use and learning. The location is a rural mountain community that has no electrical grid and no public Internet access. The project is already transforming the community's access to information and learning opportunities. Our project team of volunteers has expertise in information technology, computer learning, Internet technology and solar power. The volunteers have been helping to plan and set up computer systems and provide onsite training. Our collaborator is a community group, the Kòdinasyon Peyizan Nan Ma (KPM). KPM, a 600-member organization founded in 1981, operates the computer center inside its headquarters building. In February 2011 we installed the first two computers at the center, along with a printer and other IT hardware. The center then began providing business services and computer learning opportunities for the community. In November 2011 we installed more computers and a high-volume printer. The remaining "piece" of the center to be put into place is Internet connectivity. While we will initially subsidize the cost of installing and maintaining Internet connectivity, the KPM must determine how to sustain it by applying sound business practices. To this end, in 2013 we arranged for business and financial literacy training for the small group of farmers who are most responsible for the center's operations. 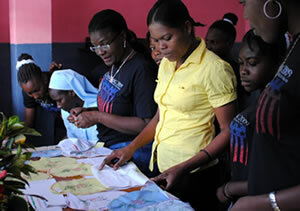 Two of the center's embroidery instructors, Sr. Welone (second from left) and Ms. Nadege (fourth from left), examine students' projects at the Maxwell Center. In Baradères, Haiti, UPLIFT Haiti helps students—primarily women—in a vocational training center to develop culinary, sewing, embroidery and other skills. 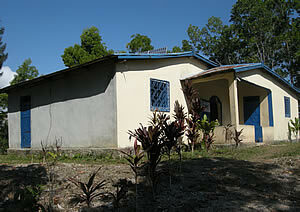 In addition to onsite training, UPLIFT Haiti provides the Maxwell School with culinary and textile supplies. Because simply having skills is not enough, UPLIFT Haiti in 2013 arranged for all current and former students of the school to have training in financial literacy and in how to start a small business. 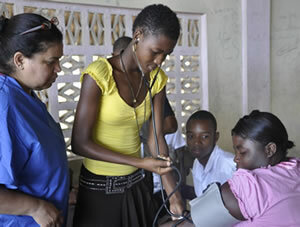 In the village of Petit-Trou-de-Nippes, UPLIFT Haiti nurse Lydie Alexandre (L) looks on while young adults practice with each other on how to take a person's blood pressure.